The business is managed under the able leadership and guidance of Mr. Navnit Kachalia, the Chairman and Managing Director. All the key personnel keep themselves abreast of latest global development in the automobiles industry by various means. The group enjoys very high status in the society and business world. 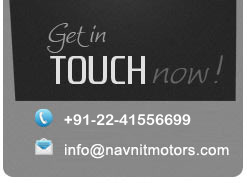 Navnit prides in possessing the greatest assets. People. On the Board and as well down the line. The Board is made of a well-groomed business family - the Kachalias. Energetic and dynamic businessmen with divergent specialties and vast experience. They are complemented with professional managers and skilled workforce. To provide mobility with comfort, style and speed anywhere be it on land, water or air. To delight customers by providing excellent pre-sales and after sales service. Investing in latest technology and techniques has always been a tradition at Navnit. This has made Navnit a front-runner, ahead of times. State-of-the-art equipments and gadgets have enhanced the performance levels, while personnel trained by the principals, both inland and abroad is a cutting edge.